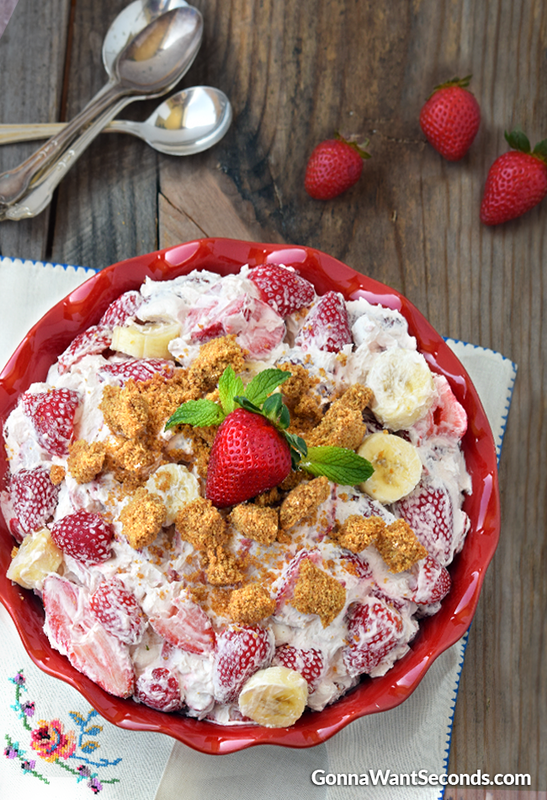 Take our Strawberry Cheesecake Salad with a Graham cracker crust on top to your next potluck, and everyone will be in creamy-dreamy, buttery-crumbly heaven! 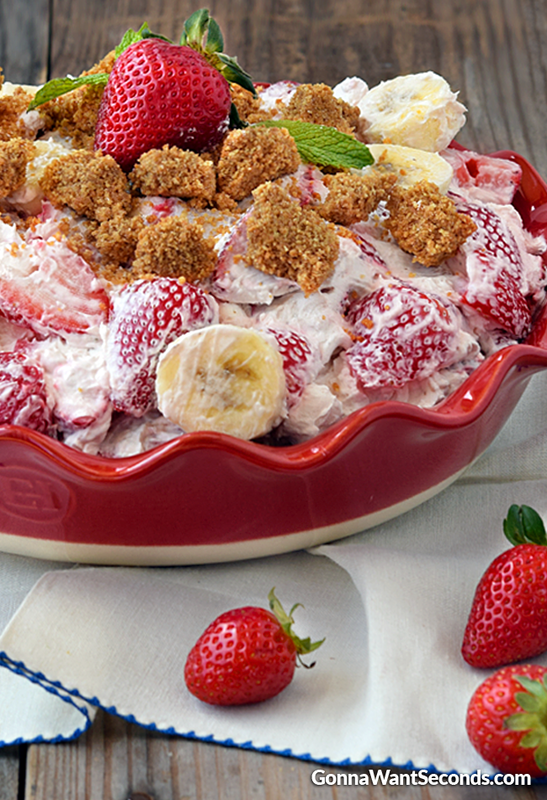 Our Strawberry Cheesecake Salad has a rich and creamy cheesecake and Cool Whip filling that mingles with two fruits that make the best pair ever – strawberries and bananas. 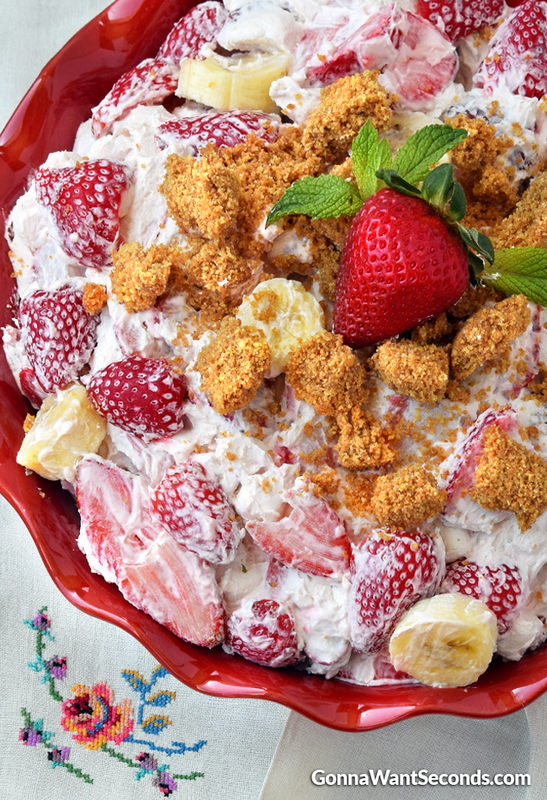 Regardless of time of year our strawberry cheesecake salad with graham crackers has fantastic written all over it! And.. even though I’m a fan, the strawberry cheesecake salad recipe critic puts out does not include graham cracker crust crumble…. hmmmmm. This cool and luscious salad is so quick and easy to make, it should be called lazy cheesecake salad! True, it’s not a green salad, but what’s in a name? If we really wanted to get descriptive, we could call it strawberry banana cheesecake salad with yogurt because that’s what it is! This Strawberry Cheesecake Salad is packed with fruit. No doubt about! I just can’t say enough about it’s layers of flavors and textures. 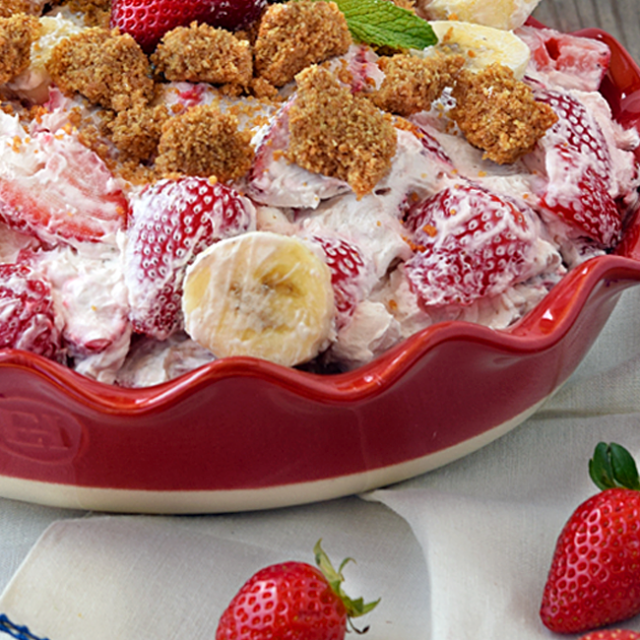 To make this tried and true strawberry cheesecake salad, you’ll first need to prepare the crumble by mixing melted butter with crumbled Graham crackers and pressing into a baking dish. Bake for 10-12 minutes. While the crust crumble is baking, you will create 2 main layers separately: the cheesecake mixture and the marshmallow fruit mixture. Fold these 2 mixtures together, and crumble on the Graham cracker crust. If you want to go a little healthier, try making strawberry cheesecake salad low carb or low fat. Just use a low-fat or fat-free version of the Cool Whip and cheesecake mix. There you have it! If you’re thinking you want an island feel, add some pineapple, kiwi, and oranges to our Strawberry Cheesecake Salad and you’ve got Hawaiian cheesecake salad! Is Strawberry Jello Salad Similar to This? Well, strawberry jello salad has some of the same ingredients like strawberries and bananas, and a creamy layer made with either sour cream or cream cheese. But, a strawberry jello salad has that super fun quality – the fruit floats!! Have you tried our Strawberry Pie? Any kind of fruit pie is welcome on my palate, and this recipe is no different. It’s made with Jello glaze, making it easy to cut and it’s just down right pretty! Can You Make Strawberry Salad Ahead of Time? Absolutely! In fact, making this Strawberry Salad ahead of time is a great idea! Just follow recipe directions, place the salad in a transparent glass bowl and chill in the fridge. It’s a good idea to wait to add the Graham cracker crumble right before serving, or taking to a gathering. How About a Greens and Fruit Strawberry Spinach Salad Instead? Have I taken it too far? No, seriously. Our Strawberry Spinach Salad is surprisingly delectable, and it’s super healthy. This salad is loaded with nutrition, after spinach all is Popeyes fav, right! Between the fruit, pecans, and spinach, you’ll have a nutrient-rich flavor party going on in your mouth! Have You Tried Strawberry Vinaigrette Recipe? If the answer is “no”, then it’s time you try Strawberry Vinaigrette Recipe, stay tuned – recipe coming soon… Plus, it goes great on our Strawberry Spinach Salad and just as healthy, too! 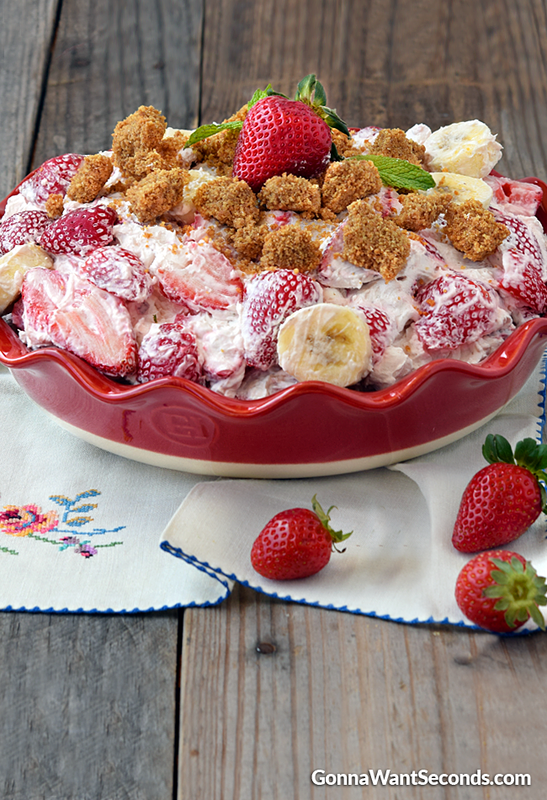 If You’re Going to a Potluck Take Along Strawberry Pretzel Salad, Too! Yep! There’s more! GWS Strawberry Pretzel Salad combines sweet, salty, creamy and crunchy to perfection. Once again, it might be a misnomer to call this dish a salad, but I don’t care what it’s called. It’s simply delightful! Strawberry Shortcake Cake – This cake is just stunning! The layers are so distinct, so the unique visual of each plays off the others. It’s like a huge strawberry shortcake! Strawberry Cobbler – Cobbler is the ultimate old-fashioned comfort food, and this recipe has a little lemon in the dough to make it the cobbler to beat all cobblers. Strawberry Triple Layer Cake – Another beauty, this cake is one kind of pink after another! It’s just loaded with fresh strawberries, super moist, and topped with a rich buttercream frosting. Strawberry Sheet Cake with Lemon Cream Cheese Frosting -This one’s a little more subtle in her beauty. She knows that less is more. What really makes this cake stand out is her unbeatable lemon cream cheese frosting! I know it’ll surprise you but we’ve got a Strawberry Banana Cheesecake Salad variation or two for you! Get a Little Nutty: If you want to add a little crunch to Strawberry Cheesecake Salad, you can add any nut you choose. Pecans, walnuts, peanuts, or mmmm…… pistachios! Get Even More Fruity: The same goes with adding any kind of other fruit. Blackberries, blueberries, raspberries, or mmmm……kiwi! Whipped Cream Instead of Cool Whip: I love Cool Whip, don’t get me wrong, but the old-fashioned flavor of real whipped cream can take this already tremendous recipe to a whole new level. Cream Cheese Variation: There’s absolutely no reason you can’t make a cream cheese filling for this salad like the strawberry cheesecake salad delish puts out. They also shake things up by adding raspberries…. WHAT! Preheat oven to 350 degrees. Spray a 9 X 13-inch baking dish with nonstick cooking spray and set aside. In a medium mixing bowl, combine the graham cracker crumbs, melted butter, and sugar and mix until combined. Press crumb mixture firmly into prepared baking dish. Using a long knife, score the crumb mixture into a 1-inch grid pattern, pressing the knife almost to the bottom of the crumbs to the pan. Bake 10-12 minutes or until golden brown. Remove from oven and cool completely. Refrigerate until chilled completely and the mixture is firm, preferably overnight. In a large mixing bowl, add cool whip, pudding mix, yogurts and vanilla and mix until evenly combined. Cover and place in the fridge for at least 1 hour. When ready to serve, slice strawberries and bananas. Add the fruit and marshmallows to cheesecake mixture and gently fold the ingredients until combined. Sprinkle with graham cracker crust crumble and serve immediately. If there's any extra crumble pass it in a separate bowl and let everyone add extra as desired. More Strawberry and Summer Inspired Desserts!